You can purchase a ticket for a 2D film in a standard seat any day of the week at Vue Riverside for £4.99. If you book online or via the call centre there’s an additional 75p booking fee per ticket. Exclusions apply. See myvue.com/legal for full terms. Mini Morning sessions at Vue Bedford give both adults and kids the chance to experience big-screen entertainment for a very small price. Both adults and children pay from £2.49* per ticket. Mini Mornings run every Saturday and Sunday morning from 10 am, plus every day in the school holidays (please check with venue for details). Every ticket, every Monday only £3.99** at Vue Bedford. Enjoy big screen entertainment for a small price. Visit myvue.com/offers to activate and book. 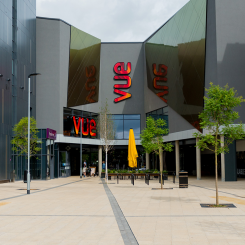 Vue cinema goer’s can park for 4 hours for just £1 at the car park on River Street. Please note, you must get your parking token validated by the Vue cinema staff to claim this discount. There’s also 2 hours free parking every Saturday and free parking all day Sunday for everyone. Vue is dedicated to giving each and every one of our guests an exceptional big screen experience. Below, you’ll find accessibility information for Vue Bedford, including details on accessible and autism-friendly screenings. We welcome assistance dogs into all our venues. If you’d like any more information, give our customer services team a call on 0345 308 4620*. You can also ask a member of our staff during your visit. Wheelchair spaces are located in each screen via the 2nd floor, only accessible by lift. 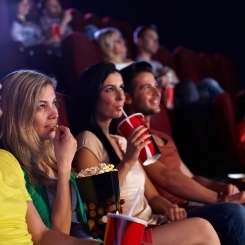 Vue also offers weekly subtitled and audio described screenings; hearing loops at all counters; automated ticket machines in the foyer; and infra-red technology in each screen to provide hearing assistance. Autism friendly screenings are held at 10 am on the last Sunday of the month. * Exclusions apply. See myvue.com/legal for full terms. *Bank holidays and other exclusions apply. See http://myvue.com/legal for details. Vue Bedford is part of the Riverside development located next to the Star Rowing Club near the Harpur shopping centre just off Horne Lane.